Biomedics 1 day extra 90 pack contact lenses are what you need if you are looking for a constant, comfortable, no-hassle eyewear. They are high performance disposable lenses with good UV blocking features, a new affordable and comfortable range from CooperVision. 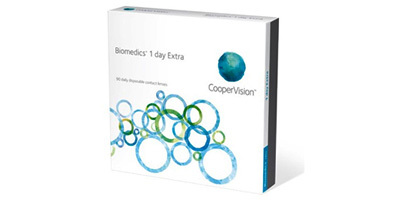 An advanced technology has been employed by CooperVision to ensure the thin design of the Biomedics 1 day extra 90 pack contact lenses. This design offers great comfort while helping the lenses to hold their shape, offering stable vision. There is no need for any cleaning, storing or caring. 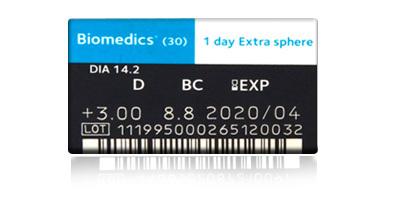 The Biomedics 1 day extra 90 pack contact lenses come with 52% water content for hydration, oxygen permeability of 19 for breathability and blue tint for easy identification and handling. If you are looking for the ultimate flexibility in wearing contact lenses, then Biomedics 1 day extra 90 pack contact lenses are for you. 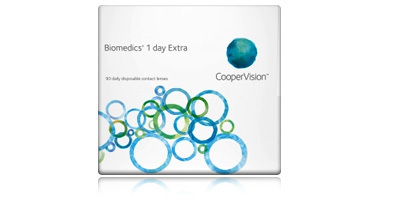 Maximize your savings and the comfort of your eyes by purchasing Biomedics 1 day extra 90 pack contact lenses from us. We are authentic dealers for CooperVision lenses.